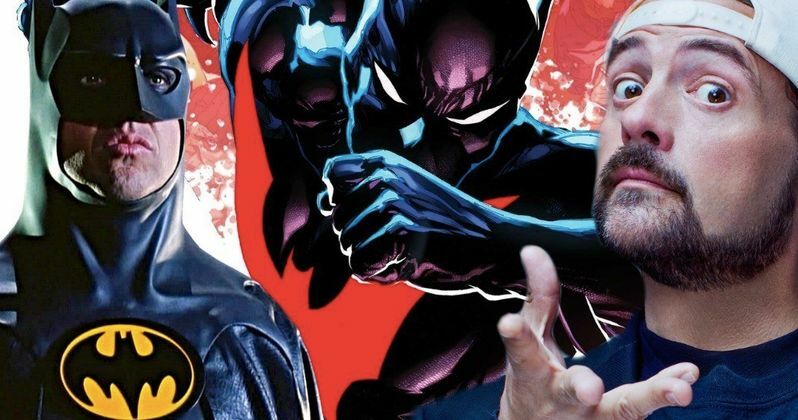 Kevin Smith believes that a Batman Beyond live-action movie with Michael Keaton would easily make $1 billion. The director/writer discussed the idea on his latest podcast with co-host Marc Bernardin, who was the first to suggest the idea, which immediately got Smith ridiculously excited along with the live audience. DC Films and Warner Bros. are currently developing Matt Reeves' The Batman, which will reportedly introduce a new and younger version of the Caped Crusader. On the Fat Man on Batman podcast, Kevin Smith and Marc Berdain started to discuss the 20th anniversary of Batman Beyond, which led to Smith admitting that he liked the original idea, but it wasn't his favorite version of the iconic character. However, when Berdain introduced the idea of a live-action movie starring Michael Keaton, Smith was immediately sold. The director writer went into some NSFW talk before launching into his excited rant. He had this to say. "That would be f*cking amazing. Could you imagine? Oh my God... that movie makes a billion, right there man. If you're like Michael Keaton's coming back, people like how is that possible and you're like because he's Batman Beyond B*tch and people are oh f*ck we wanted this our whole lives! This is f*cking good and I am down with this. When can we go?" Batman Beyond was an animated series that is set in the future of the DC animated universe and saw an older Bruce Wayne dealing with darker subject matter. The show featured emotions, personal relationships, a fear of the unknown, and the rise of technology and its effects on society. Since its release 20 years ago, it has become a fan-favorite version of the character and many have been wanting a live-action movie. Plus, this isn't the first time that Michael Keaton's name has been brought up for the project. Fans have been talking about it for years. Bringing Michael Keaton back for a Batman Beyond live-action movie would undoubtedly be huge. The actor hasn't shied away from the superhero genre having recently starred in the Marvel Cinematic Universe and Sony's Spider-Man: Homecoming as the villainous Vulture. Some Batman fans insist that Keaton is the best actor to ever put on the cowl, so it would work. But, seeing it actually become a reality is a whole other thing entirely. Michael Keaton declined to do Batman Forever because the script "sucked." Keaton insists that the "script was never great," and knew that it was in trouble when director Joel Schumacher thought everything was too dark. Keaton exited the role and was later replaced by Val Kilmer who was then replaced by George Clooney for 1997's Batman and Robin, which has not been looked at in the best light over the years. Keaton brought a darkness and edge to the character that forever changed the way the that people look at comic book movies, so why not bring him back to change the game again? You can watch the pitch for a live-action Batman Beyond movie with Michael Keaton below, provided by Kevin Smith's YouTube channel. The talk begins at about the 55-minute mark.